Vancouver Developer Eastside Games has released the social game Zombinis to the Google Plus Social network as part of a 30-day exclusive deal. This freemium game tells the story of Z Land, which has been thrown into chaos when a giant factory squished the King Zombie and his loyal army. Now it’s up to you to raise an army of Undead animals that will fight for a supremacy in a post-apocalyptic cartoon landscape. The art style eschews the usual cutesy trappings of social games for something more suited for animals whose body parts fly off when they fight. 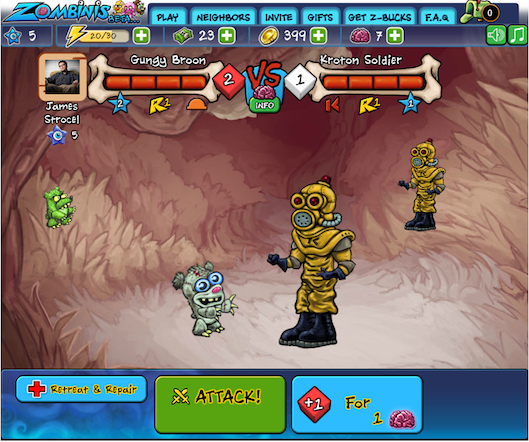 Players will find lots of creatures and attacks to explore within the game. The Facebook version will be coming soon and Eastside says they are also working on a stand alone version. You can try out the game on Google Plus here.